For its 6th edition, the Sabroso Craft Beer, Taco & Music Festival will be heading once again to the beautiful Doheny State Beach in Dana Point, California. The festival has just announced its lineup, which includes prominent acts like Flogging Molly, Good Charlotte, and punk rock band Descendants. The festival has been met with an incredible response this year and has expanded itself to two days to meet the demand. It will take place on April 6 and 7, with tickets going on sale February 1. 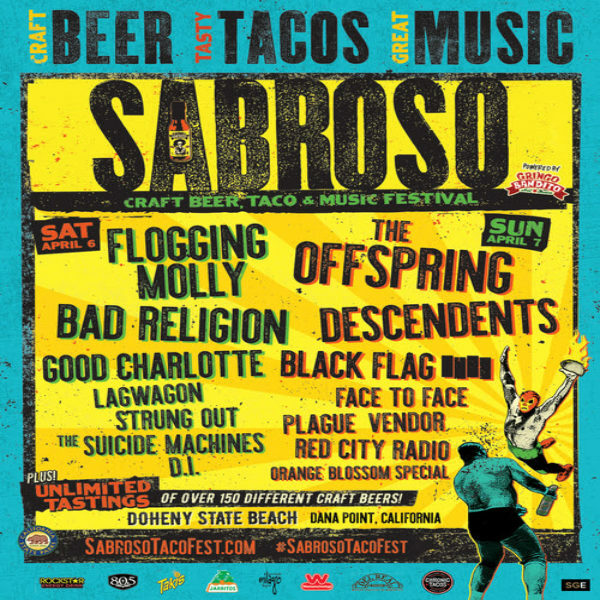 The lineup will have Celtic punk rockers Flogging Molly, Bad Religion, and Good Charlotte highlighting day one, and California’s very own The Offspring headlining day two along with Descendants and Black Flag. The festival marks a special date for Black Flag, as the band will be reuniting for their first live performance in five years. Festival-goers have much to be excited for apart from the attractive lineup. Sabroso will have a bevy of over 150 craft beer brands available for attendees to taste and enjoy, as well as delicious tacos to go along with the beers. Moreover, there will also be lawn games, contests, and even Lucha Libre wrestling showcases. The success of the Sabroso Craft Beer, Taco & Music Festival cannot be contained just to California. This year, the festival will travell across states in Western United States for single day shows in three states. They are Fort Worth, Texas on April 14, Salt Lake City, Utah on April 27, and Denver, Colorado on April 28. These single day shows will be all be headlined by The Offspring and will include performances by Black Flag, Dwarves, and Strung Out. Additionally, Bad Religion will be supporting the Fort Worth and Denver shows, while Canadian punk rockers Sum 41 will be appearing at the Salt Lake City edition.